Global equities markets fell in Monday trading on weaker than expected trade data from China. By weaker than expected I mean both imports and exports came in with negative numbers versus an expectation they would both grow. The news cemented fears that economic activity slowed in the fourth quarter, an event we all pretty much knew happened anyway. Market action was bullish despite the negative moves posted by the indices. The S&P 500, Dow Jones Industrial Average, and NASDAQ Composite all opened with losses near -0.75 (closer to -1.0% for the NASDAQ) but those losses were more than halved by midday creating green candles within last week's trading ranges. This week is the start of peak earnings. 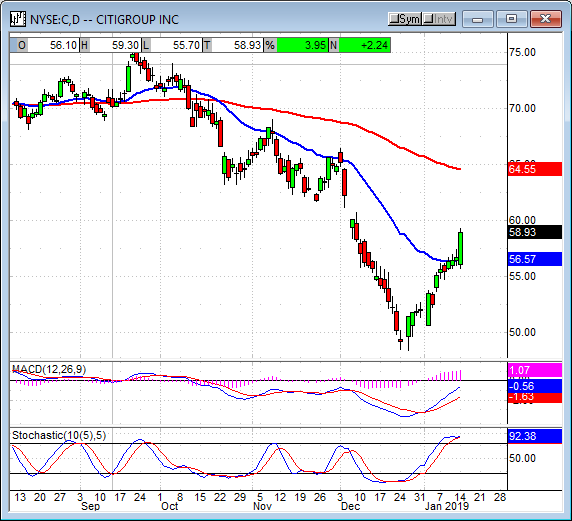 Today Citigroup reported a mixed bag of results that created some volatility before the open. The bank reported much-weaker than expected results for bond trading that offset strength in almost every other segment of the business. While shocking a -32% decline in bond revenues is not surprising given the FOMC-driven volatility that has occurred over the last couple of months. The more important segments of the business, loans and consumer traffic, were both strong. Looking forward Citigroup expects to see revenue from lending alone top $2 billion, an outlook that helped drive the stock up more than 5% in today's trading. Money market inflows drove the cash market to over $3 trillion in December 2018. This is the highest level since 2010 and a signal weak hands were shaken out of the market at the end of the year. The build-up is coincident with the November-December equities correction and may remain on the sidelines until volatility decreases. The good news is that volatility is on the decline and equities have begun to move higher so this money could begin to trickle back. In international news, the UK parliament is expected to vote on Theresa May's Brexit deal tomorrow. The outcome was, up until today, expected to be negative there are whispers of growing acceptance for the deal within the parliament. There were no economic announcements today but there are quite a few this week. The caveat is that many of them are dependent on the government shutdown which is still in effect. Now in the fourth week, there are no signs of thawing on either side; Trump says he wants a wall or a barrier, Pelosi and Schumer won't deal. 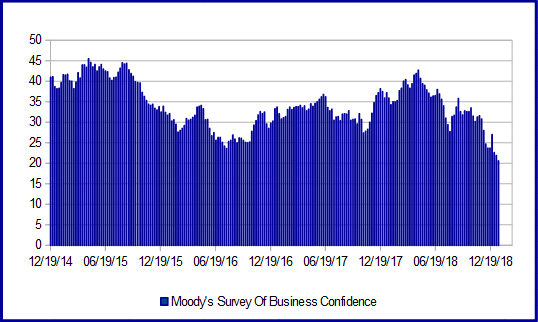 Moody's Survey of Business Confidence has slumped noticeably since the end of 2018. The survey is now at the lowest levels since I've tracked it, driven by slowing global economic data and fear of recession. The trade war is having an effect on global trade, as seen in today's Chinese trade data, and that may linger over the next month or so. If the two sides can progress at the next round of talks we'll likely see a deal soon after and that will spur activity around the world. Earnings season kicks off this week although there are relatively few companies reporting, only 34. So far, not counting Citigroup, there are about 4% of reports in and of that 90%, are beating earnings expectations. About 65% are beating the revenue estimates which isn't too bad but not enough to get the market moving. The blended rate for earnings growth is 10.6%, down from last week on revisions to the financial sector, a condition that will help more companies beat their expectations over the course of the cycle. Tomorrow reports from JP Morgan and Wells Fargo are due, Wednesday is Bank of America and Goldman Sachs, Thursday is BB&T and Morgan Stanley. The outlook for earnings growth is still positive but continues to decline. The consensus estimate for the first quarter is now only 1.8% and dangerously close to falling into negative territory. 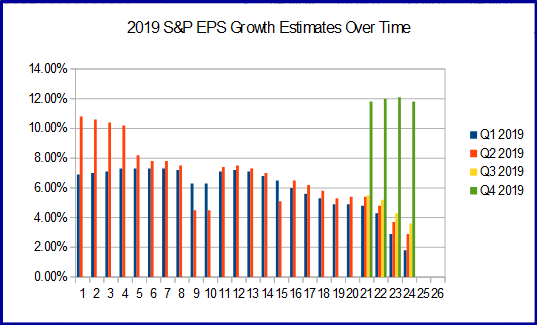 The good news is that earnings growth is expected to persist for the year and accelerate into the end of 2019 and into 2020. 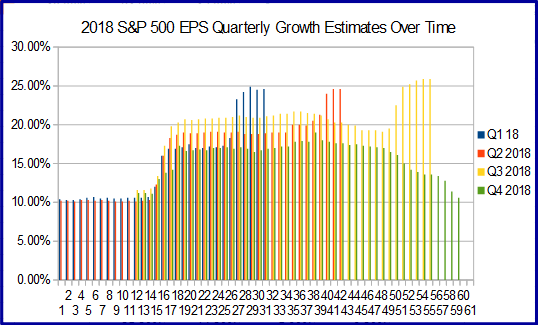 In the near-term falling estimates may weigh on equity prices; longer-term, earnings growth re-acceleration should drive the market higher. The Dollar Index drift sideways in today's action as trader wait on tomorrow's PPI data. The data is expected to show a slight downtick in producer level inflation that could lead to an interest rate cut if contraction continues. Today's candle is small and above the $95.50 level but bullish activity is not expected. With global economic activity slowing in the wake of trade tariffs I do not see the PPI data coming in strong. If the DXY falls back below $95.50 a drop to $95.00 or lower is likely. Gold prices edged higher in today's session but remain within the near-term congestion band. The band is between $1,290 and $1,300 and has dominated prices for the past two weeks. The metal appears to be in an uptrend and consolidating before another push higher. The PPI data could be the ticket, especially if it is weaker than expected. 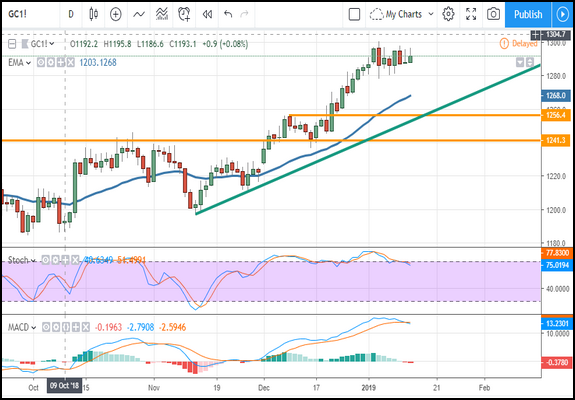 A move up in gold prices would need to break above $1,300 and, if done, could lead spot prices up by another $40 or $50. 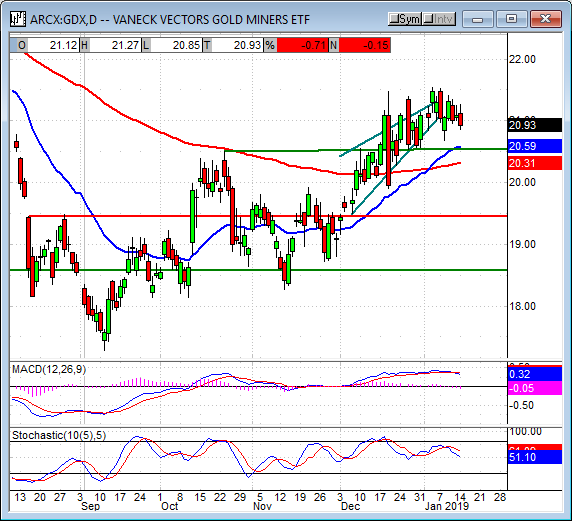 The Gold Miners ETF GDX has consolidated around the $21 level after exiting a rising wedge pattern. The ETF may be gearing up for another move higher provided gold is able to do the same. 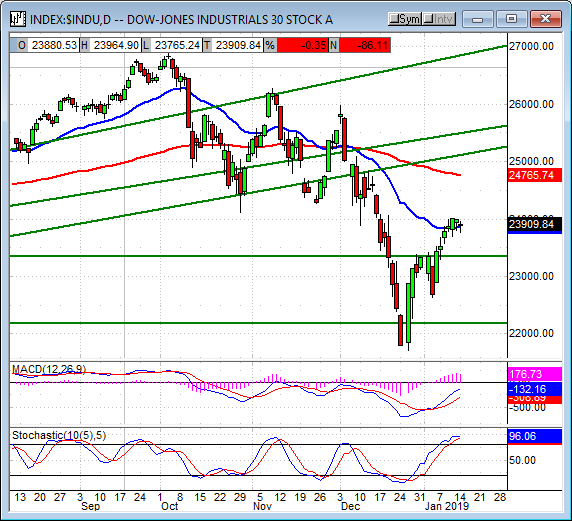 The indicators, however, do not support such a move and lead me to believe there is some weakness in this market. A fall from this level may not go far though, the long and short-term EMAs are just below and likely to provide some strong support. If the ETF moves higher resistance is near $21.50, a break above that would be bullish. Oil prices fell about -2.0% on today's data from China, slowing global trade is not good for demand. The move confirms resistance at the $52 level but that is mitigated by support at the short-term moving average. 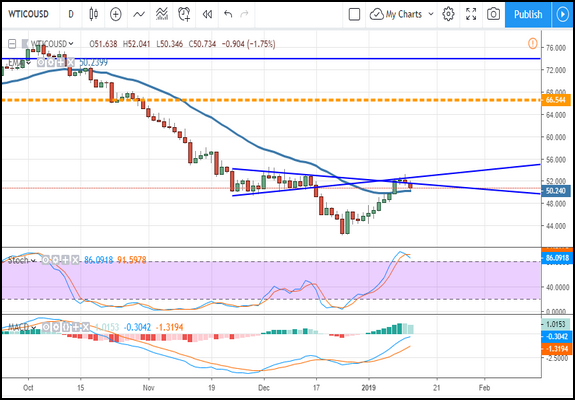 Oil price may move sideways over the next day or so, in the absence of other news, but the indicators are bullish and suggest upward price-pressure exists. A move higher would need to close above $53.35 to set a new high, if accomplished prices could continue up to $56 or $60 in the near-term. The risk is the data, if global data continues to slow demand outlook could suffer and that will weigh on oil prices. The Oil Index opened lower in today's session but was able to regain most of the loss by the end of the day. 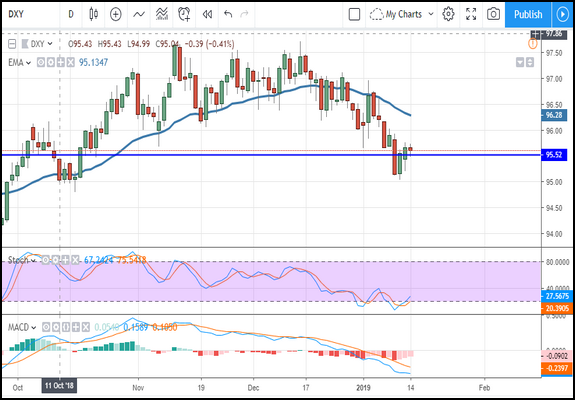 The index formed a small green candle sitting on top of the short-term moving average and within last week's range where it appears to be consolidating. The indicators are bullish but showing some weakness that is consistent with consolidation so upward drift is expected at least. A move above 1,250 would be bullish and could take the index up to 1,300 or 1,360 in the near-term. The risk this week is in the data, if US stockpiles continue to build and production is running at record highs oil may have a hard time moving higher. The California electric utility PG&E preannounced intention to declare bankruptcy. Generally speaking, announcing that bankruptcy is an option is usually the sign it's going to happen as has been the case so often before. The company is possibly liable for starting wildfires through negligence in 2018 and 2019, the damages for which run in the billions. Shares of the stock fell more than-50% on the news but found support near $10 on the assumption of the value of assets. 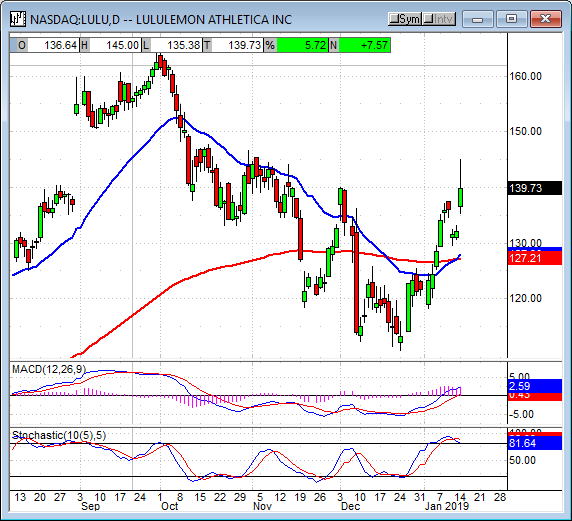 Shares of Lululemon were up 5.5% in today's action on updated guidance. The store says holiday comps were in the mid to high teens with revenue in the range of $1.14 to $1.15 billion. Updated EPS guidance is a range of $1.72 to $1.74, a full nickel above the previous. Analysts at MKM Partners say the strength is on new customer acquisition and strong product acceptance that points to strength in 2019. The Financial Sector SPDR XLF advanced more than 0.70% on the Citigroup report and general optimism for earnings from the sector. While the Citigroup report had its weak spot the core consumer business remains strong and that is the driving force within the group. 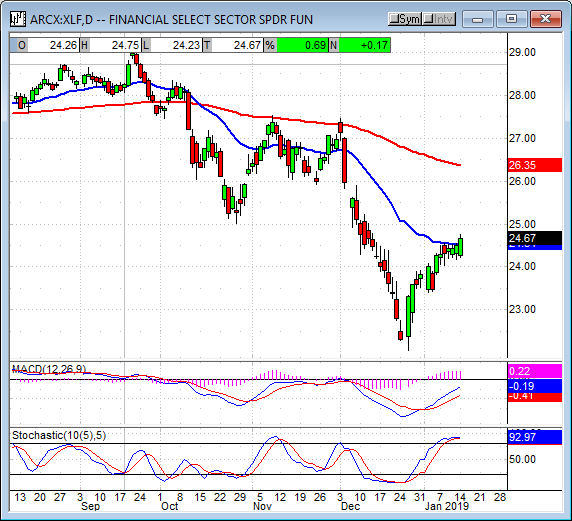 The XLF has now moved above the short-term moving average and is indicated higher by stochastic and MACD so rising prices are likely to follow. The next target for resistance is at the $25 level, a move above that could go to $26 or higher very easily. 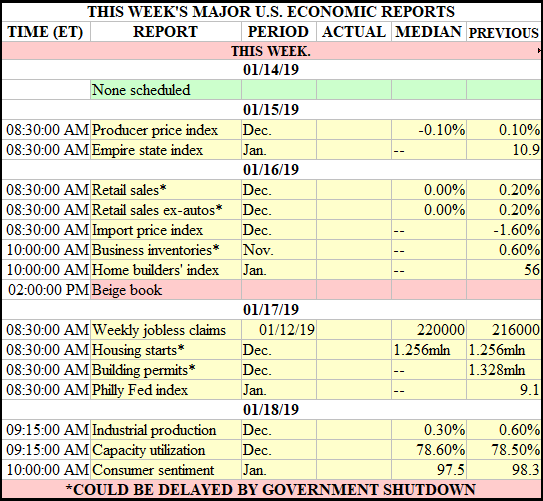 The major indices fell on additional sign tariffs and the trade war were having a negative effect on the global economy. 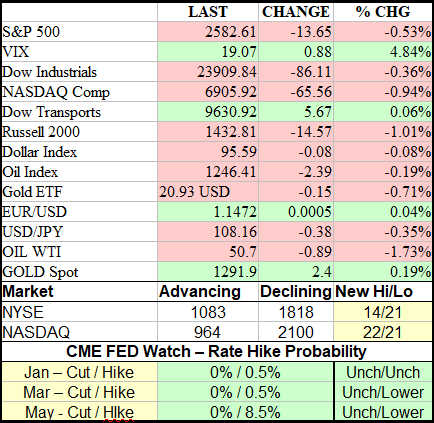 The good news is that the declines were minimal relative to recent price action and leave the market set up to rally on earnings. 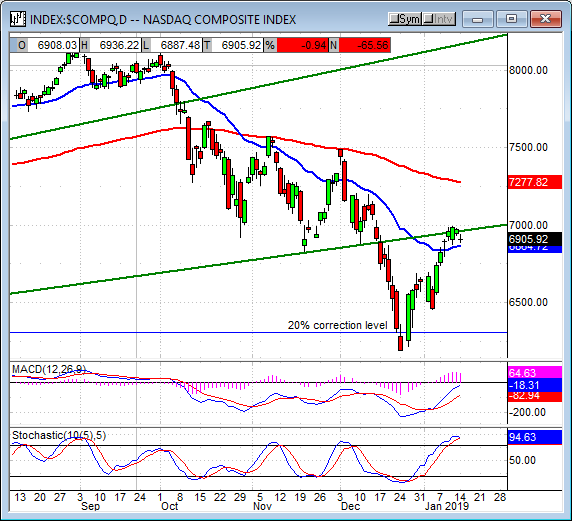 The biggest loser in today's action is the NASDAQ Composite with a loss near -0.95%. The tech-heavy index closed at the same level it opened creating a small doji candle. 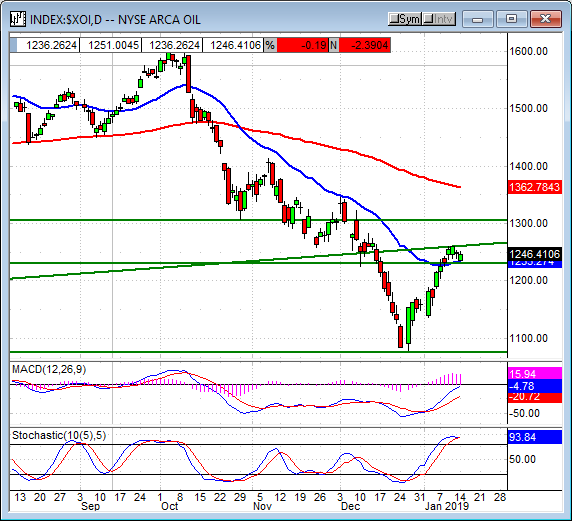 The candle is sitting just above the short-term 30-day EMA where support appears to be building. Resistance is the bottom side of a long-term uptrend line near 6,875. The indicators are bullish and suggest upward drift in prices is expected, the caveat is that they've begun to roll over which may lead to further consolidation or even a retreat fro this level. A move above the trend line would be bullish, the next target would be 7,275. A fall below the moving average would be bearish and could take the index down to 6,500 or lower. 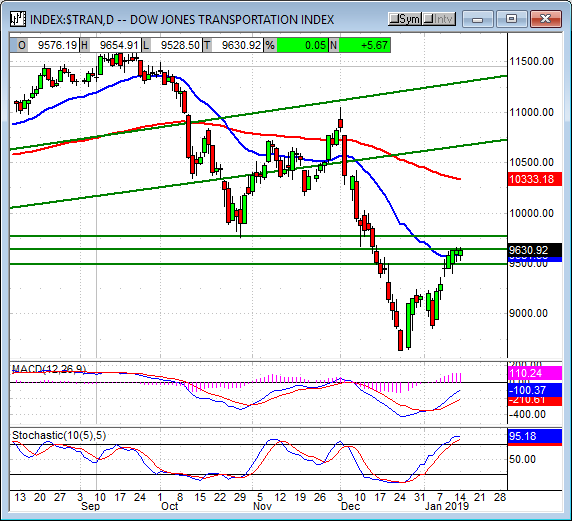 The Dow Jones Transportation Average posted the only gain in today's session with an advance of 0.05%. The transports behaved much like the broader market, opening lower and then moving higher throughout the day. The difference is in magnitude, the early losses were smaller and the later gains were larger creating a small green bodied candle. The candle is part of a consolidation that has begun to form just above the short-term 30-day EMA. The price action looks bullish and is supported by the indicators which are both consistent with rising prices. There may be resistance at the 9,750 level, a move above that would be bullish. The S&P 500 closed with a loss of -0.52%. 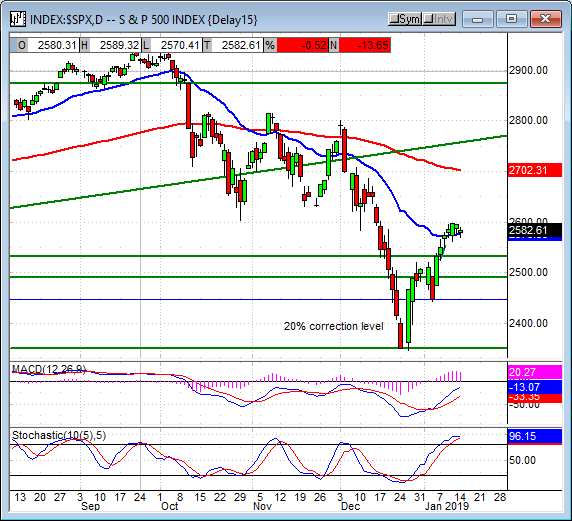 The broad market index created a small green spinning top sitting on and testing support at the short-term EMA. The price action is mild but bullish as it shows a market hovering at a point of positive support in anticipation of good news. The indicators are showing signs of price consolidation within the uptrend which is consistent with today's price movement so another day or two, maybe more, of sideways trading could follow. A move up from this level would confirm support at the short-term EMA and be bullish, my target would be 2,700 at that point. 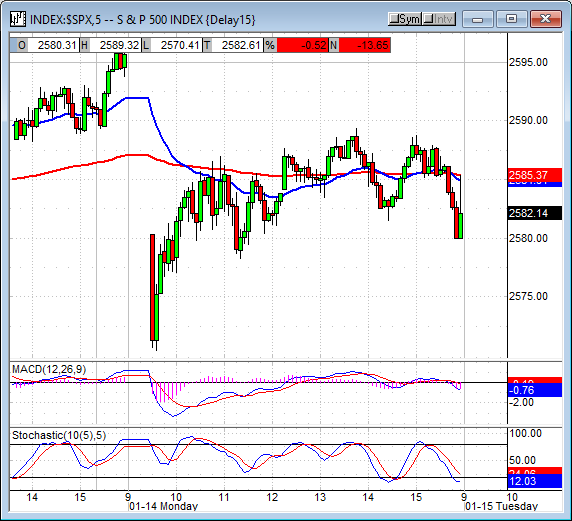 A fall below the EMA would be bearish and could take the index down to 2,550 or lower. The Dow Jones Industrial Average posted the smallest decline at -0.35%. 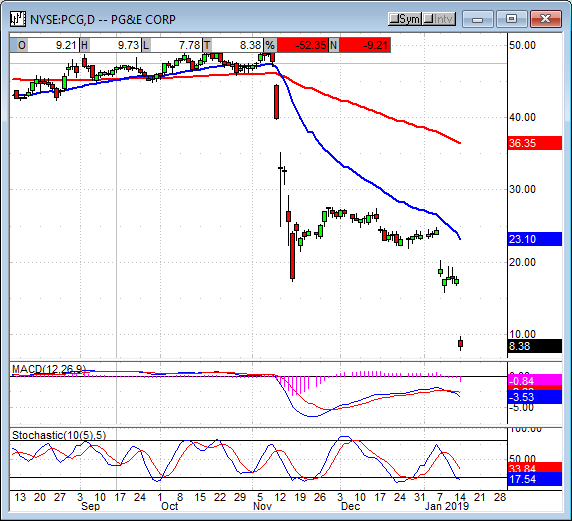 The blue chips created a small doji candle testing support, and confirming it, at the short-term moving average. The candle is not strong but is bullish and supported by the indicators so upward pressure in prices is expected. There is resistance just above today's close, near 24,000, that needs to be crossed before the all-clear is called but the signs are promising that will happen. A move above 24,000 would be bullish, my target would be 24,765 to 25,000. Today's news was not good but the bulls were resilient in the face of it. While signs of slowing global growth are a concern, a serious one, the data is for December and a time before trade relations improved and the threat of new tariffs retreat to the background. Looking forward, economic growth is still expected around the world if at a slower pace than before. The good news is that positive tailwinds are building around the FOMC and the trade-talks that will fuel a renewal of risk-on, bullish sentiment. There are still risks, of course, the government shutdown could spiral out of control, the trade talks could deteriorate and earnings growth outlook could fall into negative territory. Until then I am firmly bullish for the long-term and cautiously bullish for the near-term.